Do you have what it takes to build the ultimate support vehicle with a Toyota Tacoma pickup? Right now there is a contest that is encouraging people from all around the country to design just that. DC*shoes and Toyota is sponsoring the triple-team Toyata Tacoma buildup project. 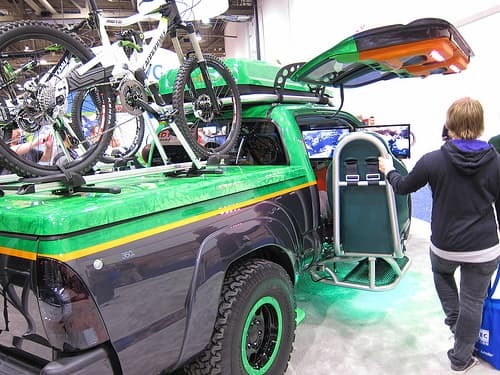 The team consists of Iikka Backstrom who is a professional snowboarder, professional skateboarder Matt Miller and Nate Adams who created the custom-built Toyota Tundra with the Rhino skinned lining. Each team was given time to design a Tacoma to suit their needs in their individual careers. Each truck was equipped differently. The Tacoma Skate is equipped to enable the owner to skateboard in the dark. It has extended lights that rise 10 feet above the truck. There is also room to sleep and an outdoor cooking stove. The Taco Moto II is designed to be able to hold a full sized dirt bike. It also has lighting on the top to be able to see more efficiently in wooded areas. The front is built sturdier to withstand any extra damage it may acquire. The Tacoma Snow II is equipped with an ultra-heavy duty snow plow in the front. There is a lighted grill cover to help carry the snow plow. There is a warm enclosure for those weekend trips that sometimes happen when the snow becomes difficult. There is also an extra ramp in the back to help load the snow machines onto the back of the truck. All three of these trucks can prove to be useful in any situation and in any kind of weather. These teams designed the trucks very well. They had very laid out plans that would help them out individually in each and every situation they may come across while working day to day in their individual professions. The contest ran until August 31. Fans of DC shoes were able to vote for their favorite truck on their Facebook page. The fans voted and the votes are in. After careful consideration of all the votes, the Tacoma Snow II was proven to be the Ultimate Support Vehicle. We can expect the new Tacoma Snow II to be available later this year. Thanks to all who voted!